Thursday & Friday 8/22/18-8/23/18: Scarf, bow and finishing touches. 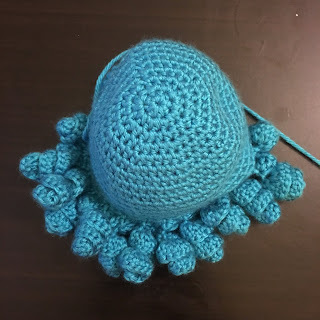 - The parts of the pattern will be released here on this page. - I will post each part the night before the scheduled day for people in different time zones. 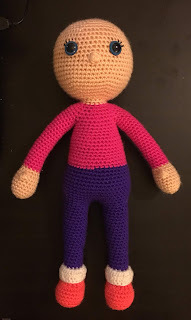 My doll measures approximately 15" tall when made with the above materials. You can use any weight yarn or thread that you are comfortable using. You do not need to use what I used for my doll, just adjust your hook size accordingly. 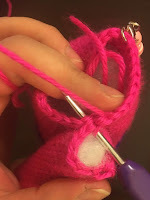 · Step 6: Yarn over, draw yarn through all 6 loops on hook. · Ch 3, insert hook into the first chain, yo, pull through. Insert your hook behind the top 2 loops of the hdc stitches (the ones that form the "V") from the previous round, and into the next loop at the top back of the stitch. R10: (3 sc, sc dec) x 3 (12) Change color to pink on the last st of this round. Fasten off and stuff arms. R9: sc dec, 5 sc, sc dec x 3, 4 sc, sc dec (14) Change to white sparkle on the last st of this round. R10-13: 14 sc (14) Change to purple on the last st of round 13. Stuff and fasten off the 1st leg but not the 2nd. Holding leg upside down, insert hook into FLO of R13. Fasten off purple. 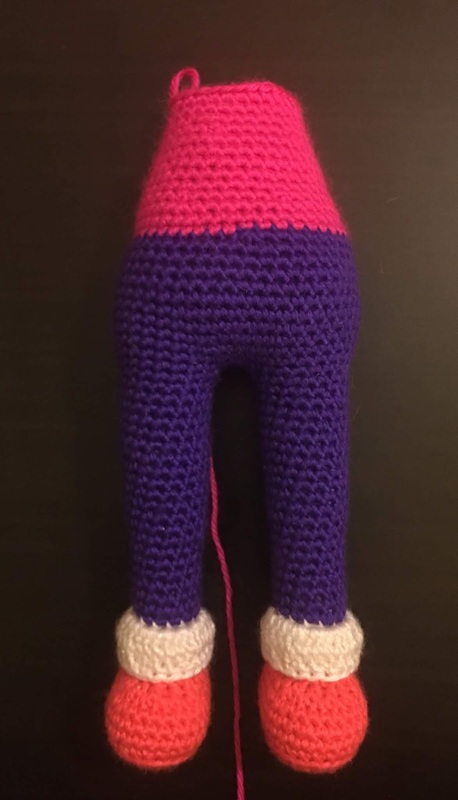 Join hot pink yarn to the center stitch at the back of the doll. R31: (2 sc, sc dec) x 6 (18) Change to skin tone on the last st of this round. Continue stuffing as you go. Insert safety eyes between R45-46, 8 sts apart. Fasten off, leaving long tail. Whip stitch FLO of R60 and pull tight to close up head. 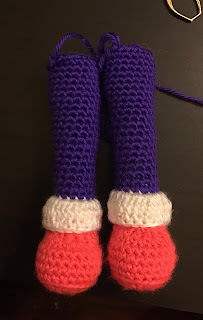 Using black embroidery floss, add eyelashes. Using pink embroidery floss, add a mouth. Fasten off and weave in ends. Add buttons to front top of dress if desired. Put the dress on the doll, then sew up the back. R15: 1 sl st, 1 dc, 8 tr, 1 dc, 1 hdc, 1 sl st, [ch 9, 3 dc in 4th ch from hook, 3 dc in next 5 chs], sl st to next st. ([ch 15, 3 dc in 4th ch from hook, 3 dc in next 11 chs], sl st to next st, sk 1 st) x 13, [ch 9, 3 dc in 4th ch from hook, 3 dc in next 5 chs], 1 hdc, 1 dc, 8 tr, 1 dc, 1 sl st.
Fasten off with long tail for sewing. Sew the hair cap to the head. Fasten off with long tail. Flatten and weave yarn needle in and out of each row – pull tight to form a bow and wrap yarn around several times. 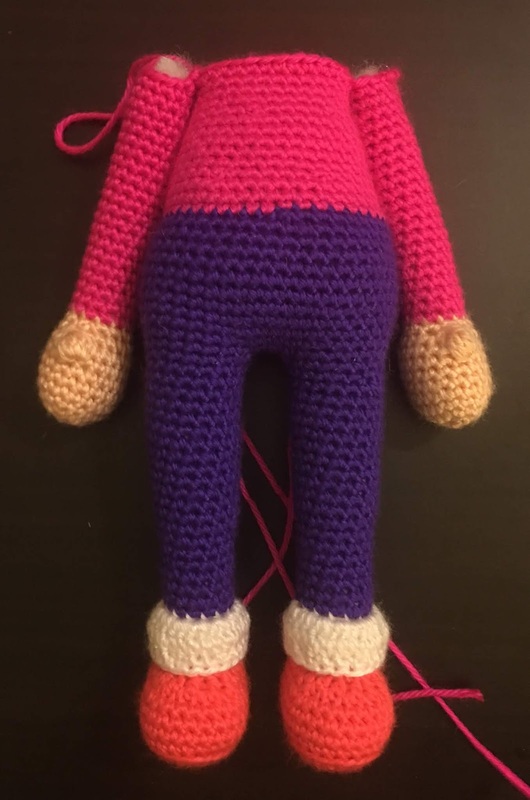 Sew the bow to the hair/head. Fasten off and weave in ends. Tie the scarf onto the neck. 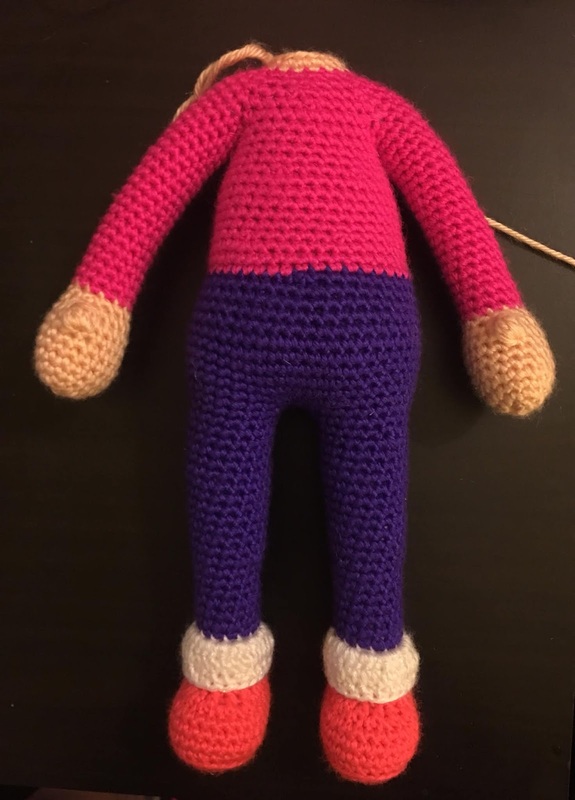 I hope you have enjoyed making your doll as much as I enjoyed designing her. No unauthorized reproduction or distribution of this pattern or content, in whole or in part, is permitted. You are free to sell any dolls made with this pattern, but please give credit when doing so. A link back to the pattern page is appreciated. I'm a mom of 2 boys from Connecticut. 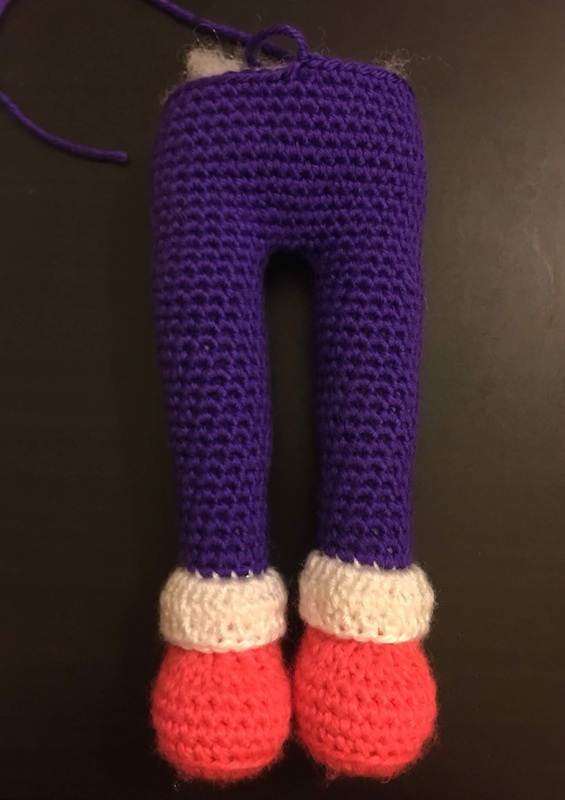 In my precious spare time I love to crochet, especially amigurumi, and design my own patterns. I also enjoy gaming, especially retro console gaming, and fantasy/comic books/movies.